Zac runs away from home to his escape his mother’s abusive partner, Lucas is challenged to jump off a cliff, and Josh learns his girlfriend is seriously ill. 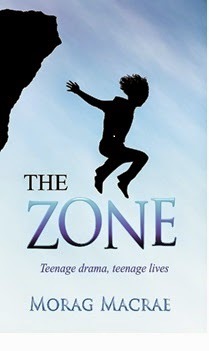 This collection of nine short stories is linked by characters who each belong to The Zone, a youth drama group. The author’s experience in similar settings comes through: these stories are full of the reality of many teenagers’ lives. That doesn’t mean they are either preachy or unremittingly bleak – there is warmth, humour and enough deliberate ambiguity to let readers make their own minds up. The cover refers to the first story – and leaves it to the viewer to decide who is in the picture. This makes it plain that the stories invite a range of readers – not just the Hollywood-perfect. Although difficult issues with complex choices are at the core of the stories, the writing style is simple and easy-to-read. The drama is often driven by dialogue and would make ideal source material for creating play-scripts or improvisation. I would recommend this collection for groups working with young people, including as a classroom resource. It would also suit those wanting a quick read with plenty of naturalistic drama and topics well worth discussing.